For over 34 years, Prestige Capital Corporation has helped nearly one thousand Early Stage and Mid-Size companies grow or turn around their businesses by providing more than $4 billion in cash advances, converting accounts receivable into immediate working capital. In 1985 founding partners, Harvey L. Kaminski and Irwin Berger worked together at a commercial lender and saw a need in the marketplace for flexible funding for service-based businesses who didn’t qualify for bank financing or traditional factoring. Factors, who catered to the textile trade, were reluctant to extend credit to companies without hard goods to secure their loan. So, the partners co-founded Prestige Capital where they pioneered the concept of spot factoring for service businesses such as staffing and consulting. The market responded favorably; service businesses were excited to have a financing option other than raising capital from friends, family, or outside investors. The concept began to gain momentum as the partners educated the business community about this type of funding. At the heart of their business was a love for helping small and medium-sized business, as well as the reward of seeing new companies launch and struggling businesses succeed. Shortly thereafter, the partners retained the talent of Stuart Rosenthal and Alan Eliasof. 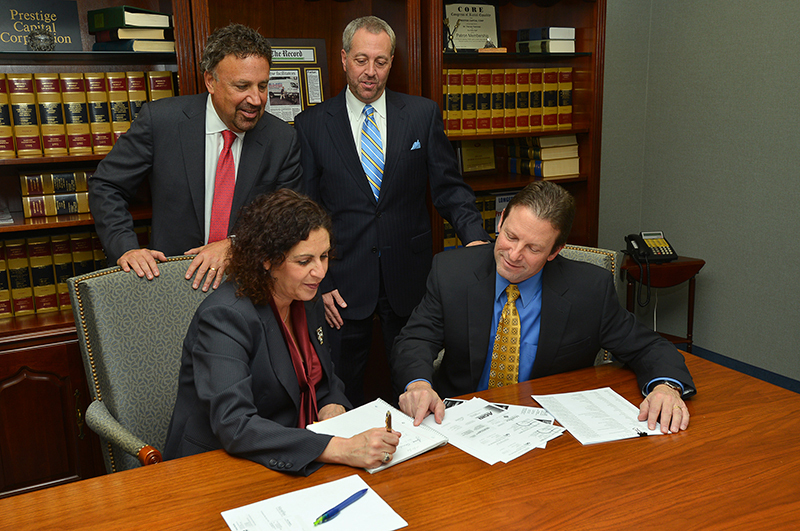 Rosenthal brought decades of experience in the commercial finance industry. And, Eliasof possessed unparalleled finance knowledge having worked previously with private companies and public accounting firms. Together, this leadership team, brought Prestige Capital to new heights. In February of 2019, Great Elm Capital Corp. acquired 80% of Prestige Capital, while the remaining equity is retained by Rosenthal and Eliasof – who act as President and Chief Executive Officer, respectively. GECC saw Prestige Capital’s long-term track record of success and continued growth, and wanted to be a part of it. With a strong capital partner like GECC, Prestige Capital will further expand their national footprint and continue to offer customers fast and simple cash flow solutions. In other words, cash flow made simple. Today, Prestige Capital continues to help companies who do not qualify for traditional bank financing or who need financing faster than a bank’s lengthy underwriting process allows. We’ve expanded into all industries and we purchase invoices from a broad spectrum of businesses whose accounts receivable range from $1 to $25 million. Our services provide our clients the working capital they need to manage operations and payroll without interruption, take advantage of new sales opportunities, or simply pay obligations in a timelier manner. Services include Factoring, Credit Protection Services, Factors Assurance Program and Back Office Services. Though we are still a Boutique Company with a high level of personal service, we have added commercial lending professionals who share our passion for helping businesses thrive. Our principals have over 100 years of combined experience in providing funds to companies nationwide. Add our in-depth knowledge of finance to our extensive funding resources and responsive company culture, and you’ll see how we are able to structure innovative lending solutions to meet many unique circumstances. What’s more, our staff of professionals, whose average tenure is over 14 years, have built a team camaraderie which extends to our client relationships. Once assigned to an account representative, you can be sure to have a friendly voice who understands your business and knows how to get you funded quickly. We consider all types of companies: public, private, start-ups, family-owned businesses and more. Among the hundreds we have financed are a publishing company, a fashion designer, and eco-friendly home furnishing company, a dental hygiene product inventor and many others. We have assisted many businesses from apparel to wholesale distribution. But don’t take our word for it, our clients say it best! Our goal is to help entrepreneurs reach the next level, whether that’s ultimately selling the business or being established enough to switch to traditional bank financing. As much as we like clients to be with us ten to fifteen years, as many have, we want to help them prosper and get to a point in the business cycle where they don’t need us anymore. We don’t lock clients into long-term contracts with cost prohibitive clauses for leaving the contract early. Our clients use our services only when they need cash. This gives them the flexibility to better manage cash flow and take advantage of opportunities to grow. We feel a deep sense of pride when our clients feel confident in taking that next step in their business evolution. In fact, each year in June we celebrate what we call our graduates – those who we’ve helped and who have been able to qualify for bank financing or achieved their particular goal. Our motto is still Cash Flow Made Simple. If you’d like to work with a flexible funding source that has your best interests at heart, in a simple, straightforward process with a fast response, contact one of our team members today to help your business realize its full potential.